It’s been a busy week for participants at the annual Farafina Trust creative writing workshop. From writing exercises to reading sessions to literary criticism and generally learning how the writing process works, the participants have been drilled all the way. One of the workshop facilitators, Molara Wood blogs about her experience here. Well, this year’s workshop ends on Saturday, 2nd of July, 2011 with a literary evening at the Grand Ballroom of the Eko Hotel & Suites, Victoria Island, Lagos where certificates will be presented to all the participants. 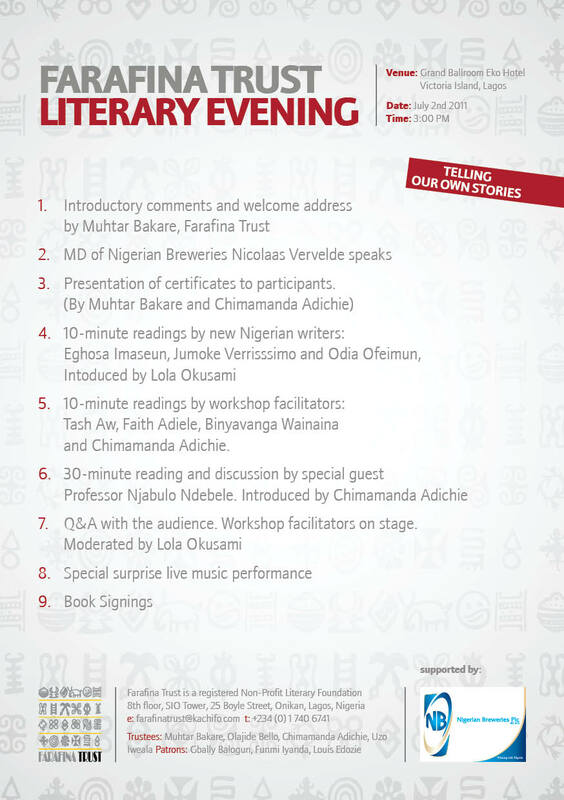 Asides this presentation, there will be readings by several African authors; Chimamanda Adichie, Eghosa Imasuen, Binyavanga Wainaina, Jumoke Verrissimo, Odia Ofeimun among others. There would be also be live musical performances, book signings and of course, your favourite Farafina titles at very affordable prices! You are sure to have a swell time so be there! *Event starts at 3pm and is free to attend so please bring a friend along! So Wole Soyinka’s The Man Died and Chinua Achebe’s An Image of Africa have made the Guardian list of the 100 greatest non-fiction books. The Man Died, selected under the category, Memoir, records Soyinka’s experiences in prison during the Biafran war. At that time, Soyinka had campaigned for a peaceful settlement of the crisis between the Biafran and Nigerian side; an idea that didn’t go down well with the Gowon administration. He was arrested and put in solitary confinement for twenty-two months for his efforts. Being in prison didn’t deter Soyinka from writing poems on tissue paper which were later published in a collection titled Poems from Prison. It is surprising that the book made the list as it is widely believed that Achebe’s criticism of Conrad has been the snag in his winning the Nobel prize. Please read the article and let’s know what you think! Sometime last month, we announced the Voice of America flash fiction competition. Winners have emerged and we say a big thank you to everyone who sent in entries. It was such a challenge choosing the winners! Well, these are the winning entries in no particular order. At first Ego couldn’t care less about his complaining. Still seething over his deception, she replied with non-committal grunts, her eyes glued to the TV (her constant companion these days) as he rattled on about the inconveniences of his workplace and the idiosyncrasies of its residents. But then, her husband returned home one day, looking forlorn and depressed. Rose Kelly had died. For many days, he remained inconsolable and for the first time since she married him, Ego heard in his voice, an enthusiasm that she had never noticed as he described the antics of the residents including the now dead Rose Kelly. Ego began to realize that his complains about Rose Kelly had been nothing more than a strange way of expressing his fondness for the woman. Ego’s estimation of her husband rose a notch then. Though he had lied to her, he really was not a bad person. It mattered to her that he actually cared about those old people in a job most would find unattractive. We all looked at him jealously like the competing peers of the girl whom the village prince had chosen to marry. Onwordi rubbed it in. “Abeg open it”, I said, irritated. Onwordi put the letter in his back pocket and declared that unless we bought him a drink, none of us would read the letter. While the others quickly reached into their pockets to contribute for his drink, I folded my arms, swearing to myself that I would not pay to read the letter from America. The contributions were short by twenty naira and they needed me to pitch in. “Oya, bring your own, it is you we are waiting for” Chukwuka said to me. I turned my face away. I felt all their eyes judging me and making me seem like the killjoy who was jealous of Onwordi’s moment of glory. I had twenty naira. The silent entreaties were killing me. Reluctantly, I pulled out two ten naira notes and Chukwuka grabbed it from my hand to place the order- one 35cl bottle of Coke and three shots of ogogoro. Ikenna, the shortest in the group offered to mix the drink for the new hero. As Onwordi drank, sporting a conceited look on his face, I felt every gulp like a dagger in my chest. As he brought out the envelope and began to open it they all huddled around him. I didn’t want to but I told myself I had paid for this and got up to see it too. It was a short letter. I didn’t know when I burst into delirious laughter. His profession wasn’t the only thing about which he gave a false impression. She discovered soon that even the smiles in those glossy pictures he sent her had been contrived. Her husband, like a professional bouncer, arranged his face always in a serious frown, unless at the nursing home where he flashed pageant-like smiles. When her mother first mentioned the arrangement, Ego had been hesitant. “But I don’t even know the man,” she’d said. Ego knew the motivation for her mother’s impassioned arguments–America. Still she agreed to be given to a man who she knew only through pictures and eulogies passed on to her mother by his own mother, their landlady. In America she thought often about the bundle of goodwill and expectations from family and friends. For their sakes, she too learnt the delicate art of creating impressions. Her letters home were filled with breezy details of fantasy. When he began spending his work-free weekends away from home and came back smelling of ladies’ cologne, she wrote about their romantic weekend getaways. When his usual complaints about all she did graduated to ignoring her altogether, she boasted about being married to the “most sensitive man in all of America.” When postcards had to be sent and they took the odd picture in which he planted a big kiss on her eager lips, she tagged it “My American dream.” No mention was made of how he wiped his lips afterwards as if she’d planted a mole there. She would see it through, she thought. The alternative was…no, she would see it through. Ignore the silly old woman.” Ego replied one evening, massaging his shoulder with one hand, surreptitiously pinching her nose with the other. Most times, she would urge him to take a shower to relax his nerves. Still, she resisted him when he touched her. Until he forced himself on her: then she would lie, stiff like a rod, sobbing as he moved in and out of her. Rarely did Ego call her family. They always inquired about ‘Doctor’, always asked if she was pregnant. She assured them –with her contrived accent and learned lilt – that the doctor was fine, and that a baby would come soon. Their questions upset her. They aroused those feelings of resentment she had been trying to suppress; elicited that inexplicable weight that seemed to block her windpipe. And because she thought it unethical to discuss her marriage with anyone, she stopped calling home. No one heard of her miscarriage. The women she worked with at the local restaurant discussed their troubled marriages. She found comfort in listening to their bitter tales. “Hey, Ego. You never talk’bout yo’man.” The cook once asked. “I’ve got nothing to say.” She’d replied. Months passed. As Ego’s second pregnancy became prominent, she started having picturesque nightmares. While asleep, she screamed maledictions, jerking spasmodically like an epileptic. Her worried husband dragged her to a Priest for exorcisms. Vacuously, she peeped at the Priest through a wired-gauze, reciting the prescribed prayers. The nightmares became more tumultuous. One night, in her dreams, propped up on her husband’s protruding stomach, she pressed a pillow on his face. While he struggled, she had orgasms and purred. At dawn, sunrays poured across her face pressed on the pillow. Groggily, she fluffed up the pillow, brushed her husband’s face. He didn’t snore; didn’t stir; didn’t grunt. …as he tucked the envelope in his back pocket. Everybody started talking at the same time and it took Ambo’s arrival with the drinks to calm us down. Everyone quickly took a seat and grabbed a drink. “Onwordi the great,” someone shouted. “So who is she?” I asked. “She is a dancer and a beautiful one at that,” he replied as he pulled out the envelope and brought out a picture from it. Someone snatched it from his hands and the rest of us rushed to get a glimpse of it. A beautiful black lady with lush lips, bright eyes and a full bossom smiled at us. “Wait o, is this not Omolara?” the youth corper serving in our village asked. Congratulations to all our winners! Please pick up your prizes at our office, 253, Herbert Macaulay, Way, Yaba. More about flash fiction here.